We had an absolutely wonderful time in Uganda. Four of us (UK teachers) went there during our half term. We spent time inspiring and developing the teachers there who work day-in day-out at Pencott Valley Primary School. 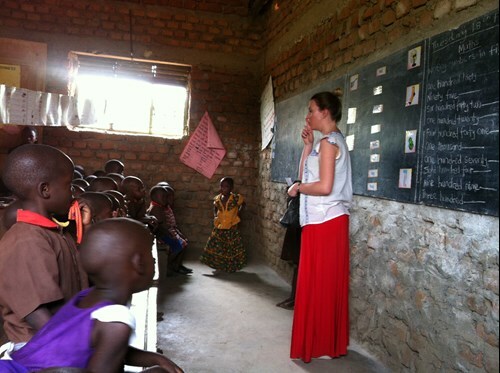 The school is located in an urban slum in a place called Mbale. It's a beautiful setting and the children are delightful. Most of the children at this school come from very impoverished backgrounds and many are orphans. Without the help of Operation Orphan donors, these children would not have the opportunity to a primary education. A small minority of the children come from families with the means to pay for their schooling. This offsets the cost of running the school, with the additional money raised through partner schools, Penwortham Church and individuals giving to the charity. The aim is to make significant improvements to the teaching and learning at the school over the next few years. Raising these standards will help to raise the confidence of parents who have the means to pay for their child's education, making the school more sustainable. During our week we split the school into two groups (lower and upper school) to effectively model teaching methods as well as use of resources to the Pencott teachers. This was an inspirational time and we were able to share our skills with the staff whilst enjoying teaching in another country and culture. This was a unique experience to add to our professional development. It was a steep learning curve for us but we all enjoyed it so much. It was totally life changing and the children'â€™s gratitude for every tiny thing was so overwhelming. It definitely made us realise how privileged we are to have the resources we take for granted at our own UK schools. We took with us some money (£200) raised by a parent from Eccleston Primary School and a donation from our school too. This was great as we were able to buy some resources for teaching and also replace a saucepan, plates and cups which were previously stolen from the school kitchen as well as purchasing some mats for the nursery children to sit on instead of the concrete floor. Kayleigh focused much of her week on phonics training in the lower school. This was all very new to the teachers who were encouraged to learn a completely different approach to their teaching. They picked it up really well and were so grateful for all the help and support given. Kayleigh left behind the resources needed to continue with this and offered lots of hands-on support during the week which made a significant impact. By the end of the week we observed a lesson taught by one teacher who had absorbed it all beautifully and managed to deliver her own successful lesson. Our hope is that as we work on this area in the lower school, it will impact the reading ability of children as they move upwards through the school. Karla very kindly added manual labour to her teaching skills and painted the brand new classroom a brilliant-white! She spent her week teaching all sorts including Comprehension, Maths (with Clare) as well as team-teaching ball skills, working with one team in particular on their rugby skills. They really enjoyed this and the football kit donated Manchester United made this really exciting for them. Clare very enthusiastically shared some new maths strategies and games to help make their maths teaching more fun, but also raise their level of UNDERSTANDING. The teachers loved the strategies for division they had never seen it before and began using this right away. Clare was so a real inspiration. Cyrilyn brought a suitcase full of big books, donated by St John the Baptist Primary School, Nottingham. These were a brilliant resource for the teaching of many lessons. In a school where resources are so limited – having access to books (especially ones that are big enough for the whole class to see) is like gold. A huge thank you to Eccleston primary School for your donations and on-going support to this excellent project and to all the schools in the Northwest, Nottingham and Norfolk who have supported Pencott. Thanks also to Penwortham Church and other individuals who make regular donations to keep this school running. It was fantastic to meet the children who have directly benefited from your giving.